It's been a hard winter in Finland this year. We are experiencing huge temperature gaps between North and South within days and even hours. Batteries, heaters, lights and winter tires are the bestsellers. Retailers and customers are seeking quality products at budget price. Workshops are looking for bargains. 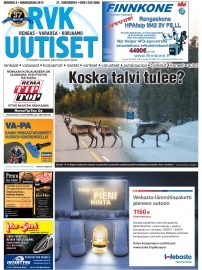 RVK Uutiset B2B magazine targets various groups, including retailers and workshops, distributors and aftersales. Establish your products known in Finland by advertising in RVK Uutiset, specialist magazine for motor vehicle aftersales and tire retail, B2B.